Thomas Was Alone is a simple puzzle platformer in which you switch control between different shapes and sizes of moving rectangles to navigate through a side-scrolling maze. It’s one of the most important narrative achievements in games. The power of abstraction is not to be dismissed. If you pay attention to it, I guarantee that Thomas Was Alone is going to make you care about a square in under five minutes. It wouldn’t work without the brilliant narration and the leagues above average writing. It wouldn’t work without the music. But most interestingly, Thomas Was Alone wouldn’t work if those rectangles were anything else, or if they represented something else. It would be exceedingly difficult and expensive to make this exact same story work with a higher fidelity graphical represenation. You could envision that, because the story of these blocks is indeed so universal and human that it’s easy to imagine it in another setting. But actually making that version would be nigh impossible. Because it’s so simple, nothing is contradicting with the way you interpret it. A big part of why the story is so effective is that it dares to be about simple emotions. Being alone, coveting the girl, wanting to find your own place, looking good in the eyes of others, being useful. These are the things we reflect ourselves in and through. The stories we tell and consume should be about these things. And videogames so very rarely are. I am not a fan of the puzzle platformer style of gameplay. I think it’s okay, but I couldn’t really tell, because I just don’t care about it. It’s something I go through because I want to hang out with these rectangles, but I wouldn’t do it for any other reason. That said, for this specific game, for these rectangles and the story we’re telling together, it’s perfect. Thomas Was Alone is a videogame single that makes you think about a time you’ve lost and the people you’ve grown up with. 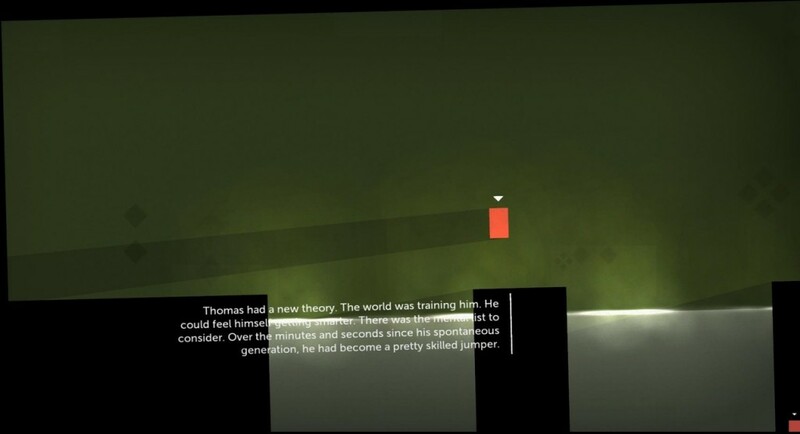 Where Thomas Was Alone is about real people, represented by rectangles, Catherine is about a movie rendition of real people, represented by you. It places a lot of trust in counting on you being able to relate to its protagonist, a software developer in his early 30s, scared to death of having to grow up and take responsibility of his life, and the life of his long-time girlfriend. These are the stories of real people, told through the medium of videogames. You may not have had Vincent’s exact dilemma, but surely if you’re beyond your early 30s, you’ve gone through something like it. 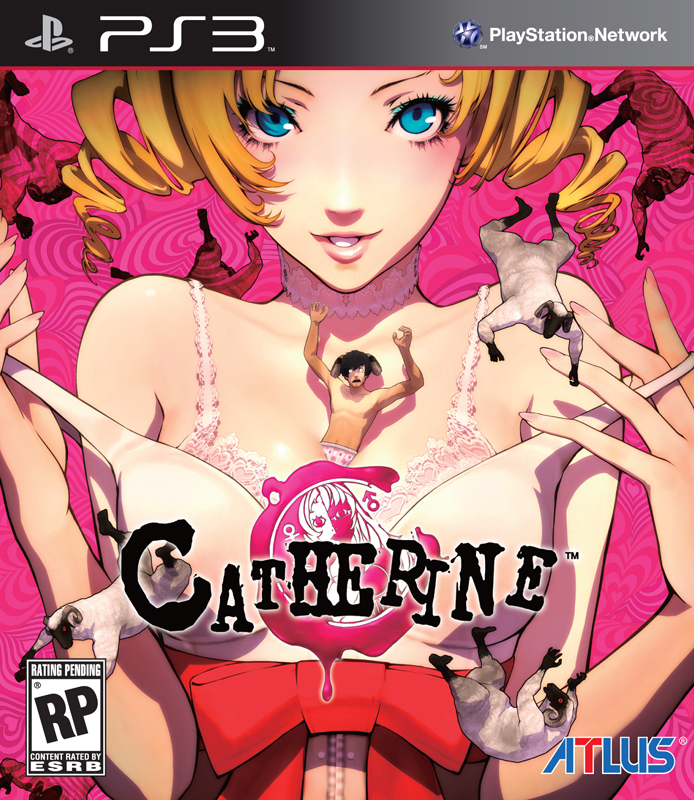 Catherine is brave for making a videogame out of the anxiety to grow up in today’s society. It dresses it in just enough make-up and costumes to not make it too banal, presenting itself as a cheap late-night TV show, something along the lines of Twilight Zone or Elvira, Mistress Of The Dark. After my first session with the game, I was frustrated by the actual gameplay of surviving Vincent’s nightly nightmares by climbing a crumbling tower made of blocks you move around to scale. It’s surprisingly difficult for me. I grew so frustrated I had to give up, never making it past the second night and thus barely out of the story’s introduction. While thematically there’s some point to what the nightmares are about – Vincent’s anxiety – in purely mechanical terms they have absolutely nothing to do with the narrative’s pull and tension. It feels needless and in the way. At the same time, the other interaction on offer is replying – or not – to text messages you’re getting while sitting in the bar at night. Writing the text messages line by line from multiple options perfectly captures the feeling of replying to sensitive communiques. This part of the gameplay is utterly captivating.